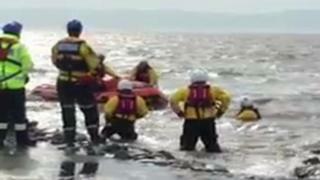 Thirty-one people, including nine children, were rescued after getting stranded by tides off the Wirral coast. Wirral Coastguard said West Kirby Lifeboat had to make multiple trips to the Hilbre Islands as people were cut off by incoming tides over the weekend. Two dogs also had to be rescued by crews, it added. The coastguard urged walkers to check tide times before setting off for the Hilbre Islands after the record number of rescues over 48 hours. Made up of three tidal islands - Little Eye, Middle Eye and Hilbre Island - they are an important site for bird watchers and offer panoramic views across the River Dee estuary to North Wales and Wirral coastlines.